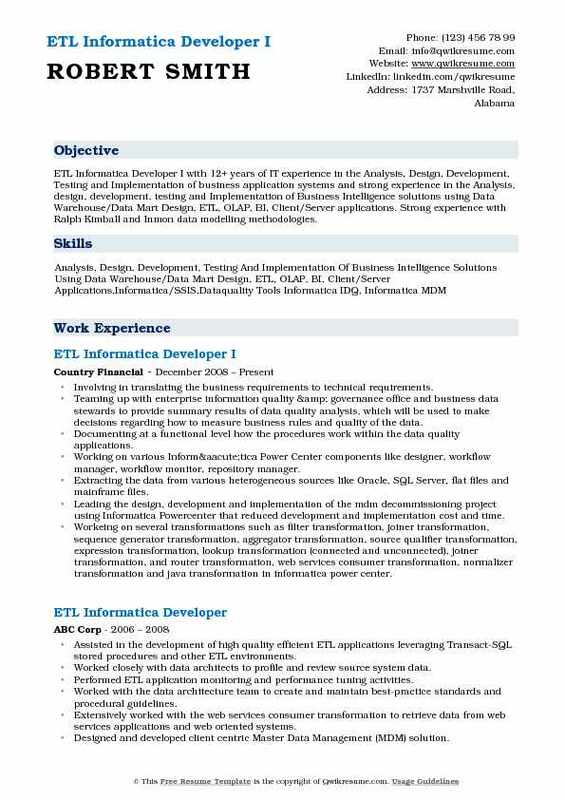 An ETL Informatica Developer is involved in converting the standard process of the company like functions and stored procedures into Informatica. 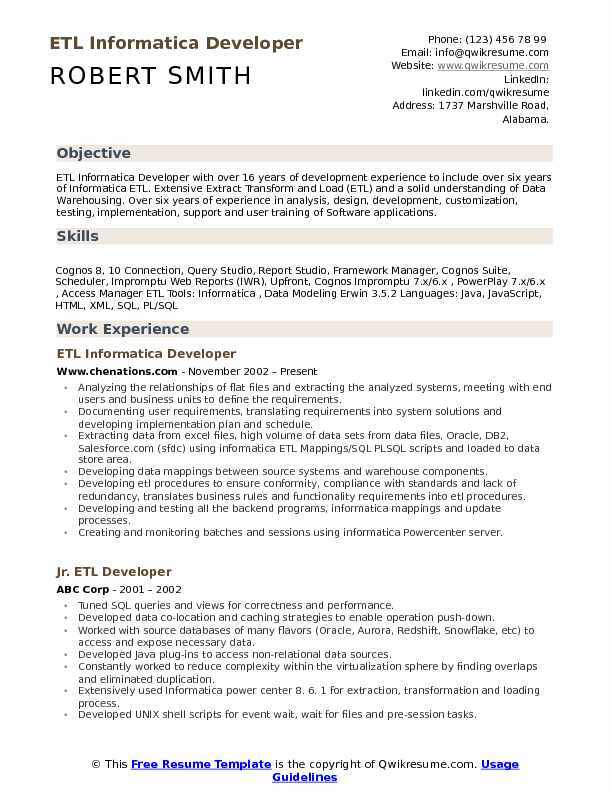 Some of the best ETL Informatica Developer Resume should list various responsibilities for such as assisting in maintaining relevant data source, ensuring that it is stored properly, developing ETL processes, designing and preparing of codes, implementing of Informatica programs, testing and evaluating the requirements, addressing and resolving the issues associated with it and handling various other Informatica development duties. Individuals aspiring to become an ETL Informatica Developer have to be an expert in handling ETL tools like Informatica and be flexible to adapt to any new technologies, they should also be familiar with various other software development processes and possess sound analytical skills. To pursue this career, a Degree in Computer Science or equivalent is the minimum qualification. 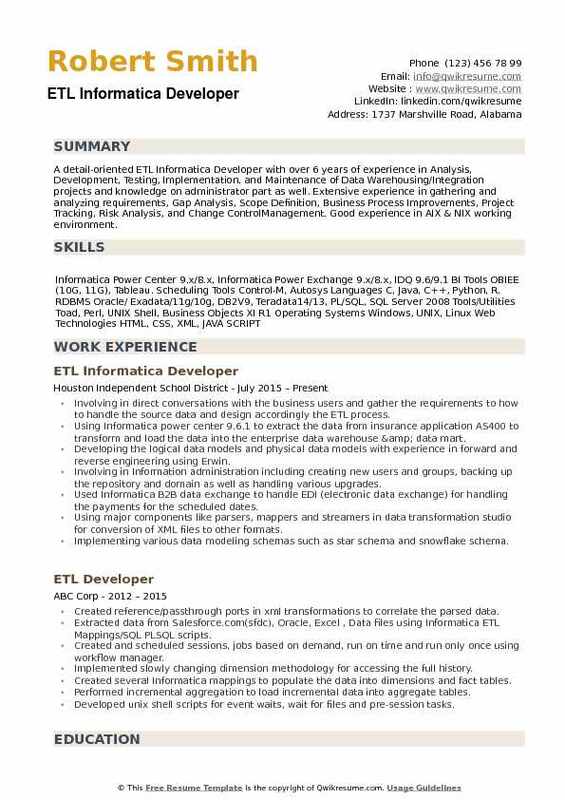 Headline : ETL Informatica Developer with over 16 years of development experience to include over six years of Informatica ETL. Extensive Extract Transform and Load (ETL) and a solid understanding of Data Warehousing. Over six years of experience in analysis, design, development, customization, testing, implementation, support and user training of Software applications. Analyzing the relationships of flat files and extracting the analyzed systems, meeting with end users and business units to define the requirements. Documenting user requirements, translating requirements into system solutions and developing implementation plan and schedule. Extracting data from excel files, high volume of data sets from data files, Oracle, DB2, Salesforce.com (sfdc) using informatica ETL Mappings/SQL PLSQL scripts and loaded to data store area. Developing data mappings between source systems and warehouse components. Developing etl procedures to ensure conformity, compliance with standards and lack of redundancy, translates business rules and functionality requirements into etl procedures. Developing and testing all the backend programs, informatica mappings and update processes. Creating and monitoring batches and sessions using informatica Powercenter server. Responsible to tune ETL procedures and star schemas to optimize load and query performance. Extensively working in the performance tuning of the programs, ETL procedures and processes. Writing documentation to describe program development, logic, coding, testing, changes and corrections. Creating adhoc reports to users in Tableau by connecting various data sources. 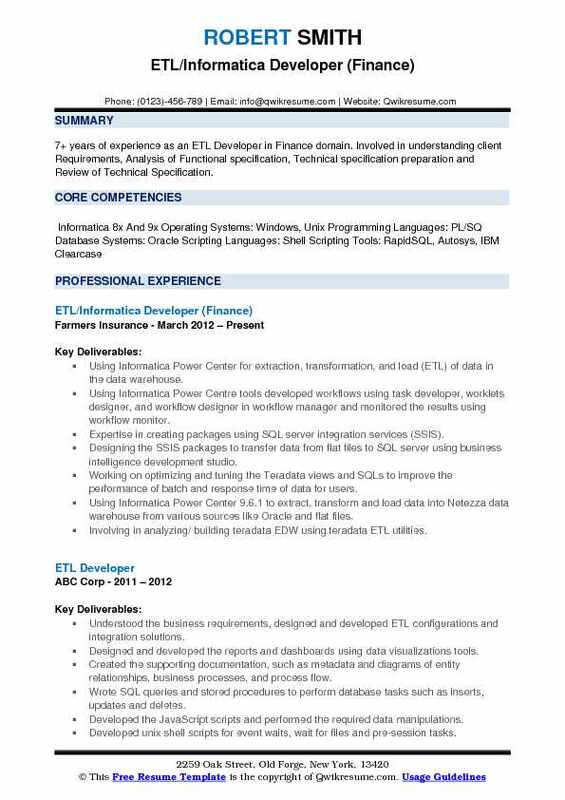 Summary : 7+ years of experience as an ETL Developer in Finance domain. Involved in understanding client Requirements, Analysis of Functional specification, Technical specification preparation and Review of Technical Specification. Using Informatica Power Center for extraction, transformation, and load (ETL) of data in the data warehouse. Using Informatica Power Centre tools developed workflows using task developer, worklets designer, and workflow designer in workflow manager and monitored the results using workflow monitor. Expertise in creating packages using SQL server integration services (SSIS). Designing the SSIS packages to transfer data from flat files to SQL server using business intelligence development studio. Working on optimizing and tuning the Teradata views and SQLs to improve the performance of batch and response time of data for users. Using Informatica Power Center 9.6.1 to extract, transform and load data into Netezza data warehouse from various sources like Oracle and flat files. Involving in analyzing/ building teradata EDW using teradata ETL utilities. Using Informatica Power Exchange for loading/retrieving data from the mainframe system. Analyzing the data sources and targets using Informatica data profiling option. Applying slowly changing dimensions like type 1 and 2 effectively to handle the delta loads. Objective : Senior ETL/Informatica Developer with 7+ years of experience in System Analysis, Design, coding and testing of Data Warehousing implementations across Financial, Pharmaceutical, Insurance and Telecom Industries. Business Intelligence experience using OBIEE10.1, Cognos, Business Objects XI Developer 2000 (Forms 4.5/5.0, Reports 2.5/3.0), SQL Server Integration Server (SSIS), MS Access Reports. Wrote Unix scripts to call the files from landing zone and process the files. Created pre_etl scripts to validate the files and file format which we receive from the source system. Extracted data from flat files applied business logic to load them in the staging database. Developed mappings/reusable objects/transformation/mapplets by using mapping designer, transformation developer and mapplet designer in Informatica Power Center 8.6.1. Wrote Oracle packages and functions to implement business rules and transformations after staging is done. Worked with pre and post sessions, and extracted data from transaction system into staging area. Used Informatica Power Center 8. 6. 1 for extraction, loading and transformation (ETL) of data in the data warehouse. Implemented populate slowly changing dimension to maintain current information and history information in warehouse tables. Used SSIS packages to load date from spreadsheet into the database and also used packages to move data between databases (Oracle, flat-files) on different servers. Created SSIS packages to extract data from oltp to olap systems and scheduled jobs to call the packages and stored procedures. Worked on different data sources such as Oracle, teradata, flat files etc. 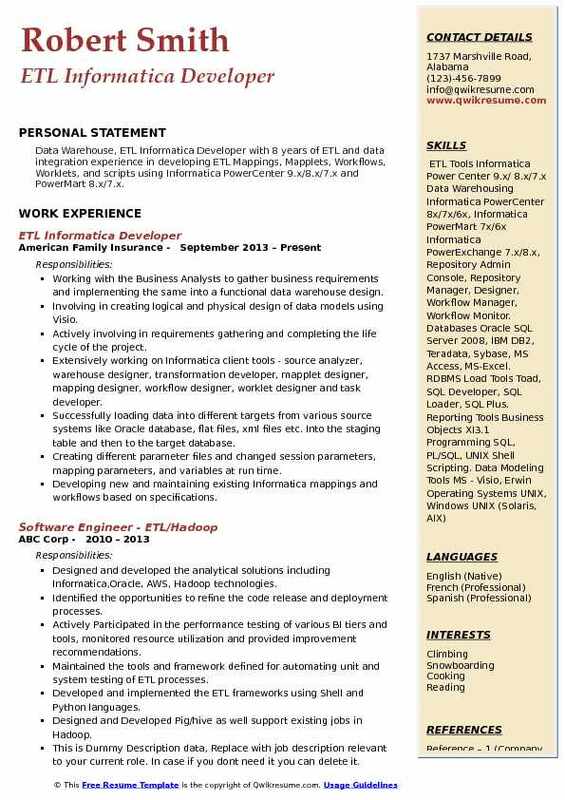 Summary : ETL Informatica Developer with 8+ Years of focused experience in the Manufacturing domain, with a strong background in Data warehousing and ETL experience using Informatica Power Center /8.1 on RDBMS databases Worked as an MDM developer, where projects are analyzed, planned, and developed. Maintained documentation of teams technical processes. Worked closely with business users, used latest technologies of Oracle database, MS SQL server database, and job scheduler. Analyzing the business requirements with Business Analyst to develop ETL procedures that are consistent across all systems. Involving in data modeling for SQL server databases to store data retrieved from flat files. Normalizing and de-normalizing the flat files and loading them in SQL server. Creating mappings/sessions and workflows for using Informatica version 9.5. Installing, configuring and upgrading the Informatica powercenter TDM/ILM to 10.1 with all EBFS. Using different types of tasks like decision, timer and event initial/bulk load process wait and command to maintain the dependencies between the sessions and load balancing within informatica workflow. Working with various transformations like router, expression, SQL, lookup, normalizer, and aggregator in building complex mapping. Involving in designing the procedures for getting the data from all the source systems to data warehousing system. 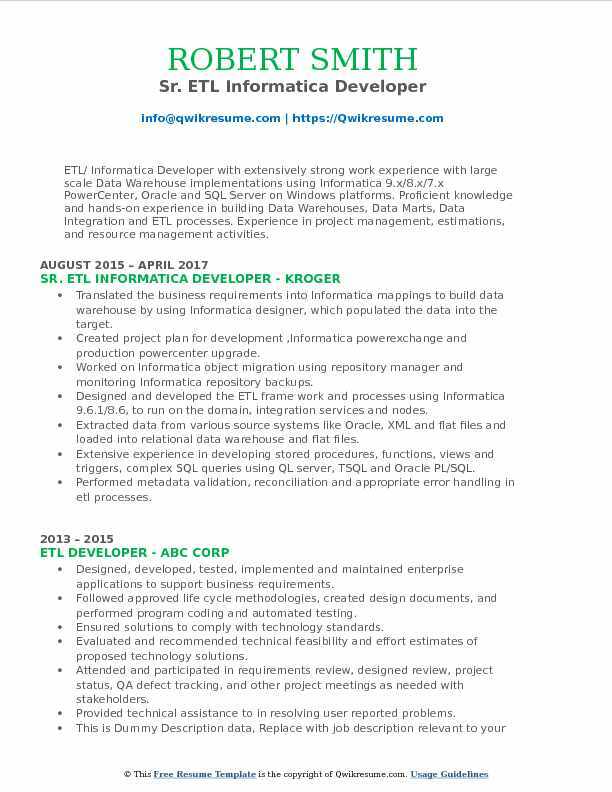 Summary : Sr. ETL Informatica Developer with over 7+ years of successful professional experience in Data warehousing development with different domains. Excellent Knowledge of Data Warehousing concepts. Expertise and experience in the following areas - Analysis, ETL design, ETL Testing, ETL Performance tuning, DB Sql. Extensive experience in developing strategies for Extraction, Transformation and Loading mechanism using Informatica Power Center in Windows and UNIX environment. Interacted with the Business Analysts to understand the business & gather technical requirements. Abstracted relational and delimited text file to local environment and developed the code in dev environment. Automated and scheduled recurring reporting processes using Unix shell scripting and teradata utilities. Checked the file formats for the source flat files using Unix shell scripts thereby ensuring input file formats are same as specified. Created mapplet for error handling process to deal with null records. Involved in devops migration/automation processes for building and deploying systems. Developed code for landing environment and then for staging and finally developed incremental load populate the target tables for atomic model. Extensively involved in writing SQL queries (sub queries and join conditions). Worked on powercenter real time edition to run the real-time workflows. This normalized model was used as a staging area for the dimensional model which was Netezza based data warehouse. Worked on aginity workbench to process all the relational objects of Netezza. 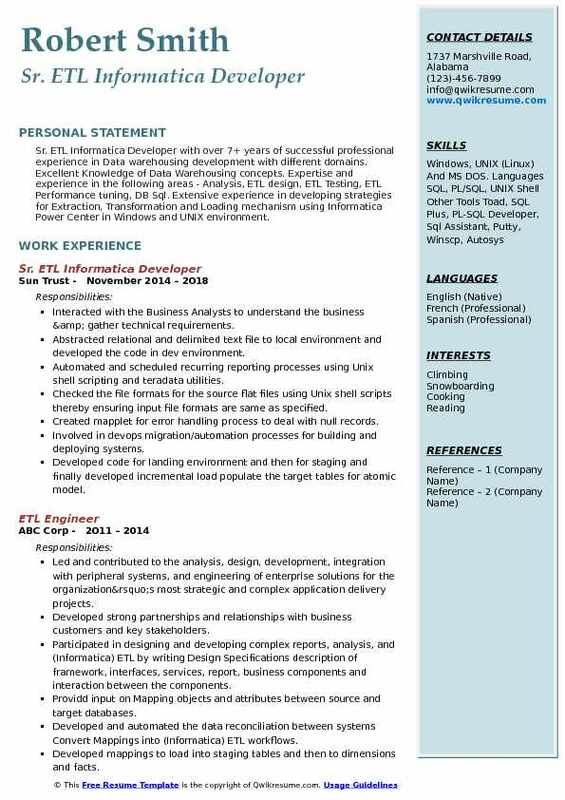 Summary : ETL Informatica Developer I with 12+ years of IT experience in the Analysis, Design, Development, Testing and Implementation of business application systems and strong experience in the Analysis, design, development, testing and Implementation of Business Intelligence solutions using Data Warehouse/Data Mart Design, ETL, OLAP, BI, Client/Server applications. Strong experience with Ralph Kimball and Inmon data modelling methodologies. Involving in translating the business requirements to technical requirements. Teaming up with enterprise information quality & governance office and business data stewards to provide summary results of data quality analysis, which will be used to make decisions regarding how to measure business rules and quality of the data. Documenting at a functional level how the procedures work within the data quality applications. Working on various Informática Power Center components like designer, workflow manager, workflow monitor, repository manager. Extracting the data from various heterogeneous sources like Oracle, SQL Server, flat files and mainframe files. Leading the design, development and implementation of the mdm decommissioning project using Informatica Powercenter that reduced development and implementation cost and time. Workeing on several transformations such as filter transformation, joiner transformation, sequence generator transformation, aggregator transformation, source qualifier transformation, expression transformation, lookup transformation (connected and unconnected), joiner transformation, and router transformation, web services consumer transformation, normalizer transformation and java transformation in informatica power center. Extensively using XML Parser, XML Generator and XML Source qualifier transformations where applicable. 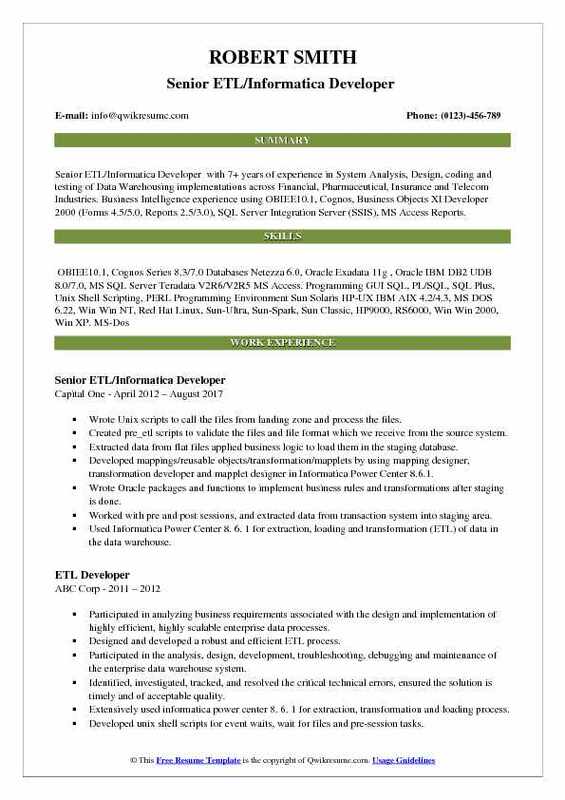 Objective : ETL/ Informatica Developer with extensively strong work experience with large scale Data Warehouse implementations using Informatica 9.x/8.x/7.x PowerCenter, Oracle and SQL Server on Windows platforms. Proficient knowledge and hands-on experience in building Data Warehouses, Data Marts, Data Integration and ETL processes. Experience in project management, estimations, and resource management activities. Translated the business requirements into Informatica mappings to build data warehouse by using Informatica designer, which populated the data into the target. Created project plan for development ,Informatica powerexchange and production powercenter upgrade. Worked on Informatica object migration using repository manager and monitoring Informatica repository backups. Designed and developed the ETL frame work and processes using Informatica 9.6.1/8.6, to run on the domain, integration services and nodes. Extracted data from various source systems like Oracle, XML and flat files and loaded into relational data warehouse and flat files. Extensive experience in developing stored procedures, functions, views and triggers, complex SQL queries using QL server, TSQL and Oracle PL/SQL. Performed metadata validation, reconciliation and appropriate error handling in etl processes. Experience in BI/data warehouse projects involving informatica products. Designed and developed complex mappings, from varied transformation logic like unconnected and connected lookups, router, filter, expression, aggregator, joiner, update strategy, stored procedure and more. 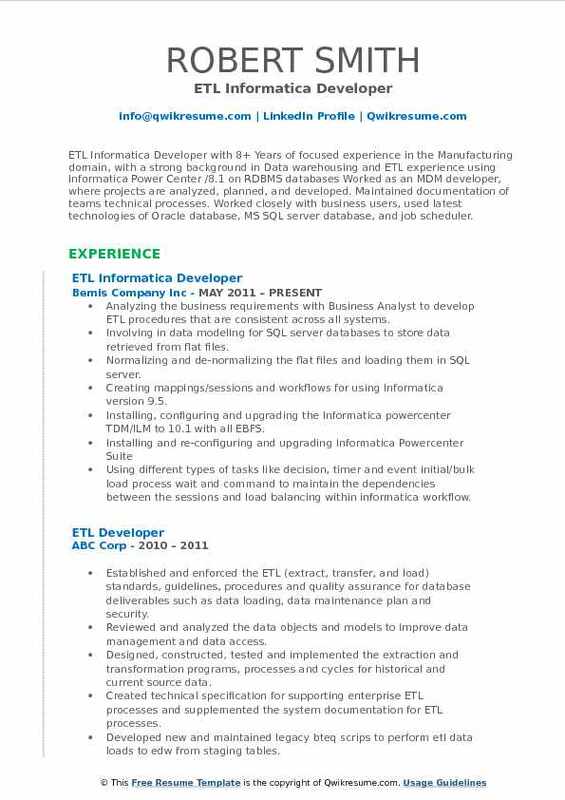 Summary : Over 15 years of experience as the ETL/Informatica developer. Good experience in the Analysis, Design, Development, Testing and Implementation of business application systems for Health care, Insurance and Financial purpose. Experience in Business Intelligence solutions using Data Warehousing/Data mart design, ETL and reporting tools. Analyzing the source data, coordinating with data warehouse team in developing relational model and participated in the design team and user requirement gathering. Working as a developer in creating complex stored procedures, triggers, functions, indexes tables, views and other T-SQL code and SQL joins for applications. Developed various T-SQL. Storing procedures, functions and packages, built Data Transformation Services (DTS) packages for ETL using DTS wizard, involved in designing er models (logical/physical) for Oracle database to store data retrieved from other sources including legacy systems. Extensively using Informatica Power Center to extract data from various sources and load into staging database. Solving T-SQL performance issues using query analyzer. Parsed the data from XMLs XSD file using XML. transformation. Participating in the detailed level and high-level design documentation of the ETL system and mapping of business rules. Interacting with the business representatives for need analysis and to define business and functional specifications. Retrieving the data from MQ series sources. Working on golden copy of master data management tool of informatica (Informatica MDM). Expertise in the optimization of the performance of the designed workflows processes in informatica and to identify the bottlenecks in different areas after the full volume system run. 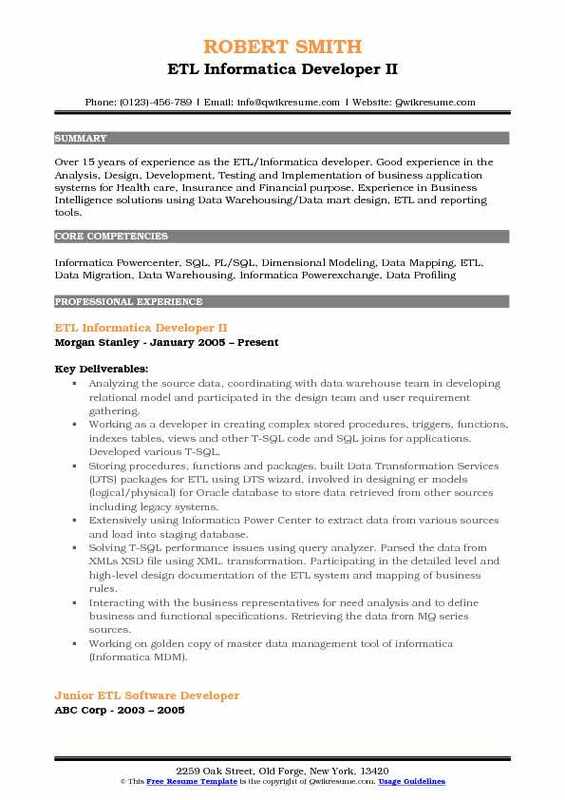 Summary : Data Warehouse, ETL Informatica Developer with 8 years of ETL and data integration experience in developing ETL Mappings, Mapplets, Workflows, Worklets, and scripts using Informatica PowerCenter 9.x/8.x/7.x and PowerMart 8.x/7.x. Working with the Business Analysts to gather business requirements and implementing the same into a functional data warehouse design. Involving in creating logical and physical design of data models using Visio. Actively involving in requirements gathering and completing the life cycle of the project. Extensively working on Informatica client tools - source analyzer, warehouse designer, transformation developer, mapplet designer, mapping designer, workflow designer, worklet designer and task developer. Successfully loading data into different targets from various source systems like Oracle database, flat files, xml files etc. Into the staging table and then to the target database. Creating different parameter files and changed session parameters, mapping parameters, and variables at run time. Developing new and maintaining existing Informatica mappings and workflows based on specifications. Creating mapplets, reusable transformations, worklets and used them in different mappings, workflows. Using source qualifier, expression, aggregator, lookup, router, normalizer, sorter, stored procedure transformations to do necessary data calculations and manipulations according to the business rules and loaded data into target systems. Summary : A detail-oriented ETL Informatica Developer with over 6 years of experience in Analysis, Development, Testing, Implementation, and Maintenance of Data Warehousing/Integration projects and knowledge on administrator part as well. Extensive experience in gathering and analyzing requirements, Gap Analysis, Scope Definition, Business Process Improvements, Project Tracking, Risk Analysis, and Change ControlManagement. Good experience in AIX & NIX working environment. Involving in direct conversations with the business users and gather the requirements to how to handle the source data and design accordingly the ETL process. Using Informatica power center 9.6.1 to extract the data from insurance application AS400 to transform and load the data into the enterprise data warehouse & data mart. Developing the logical data models and physical data models with experience in forward and reverse engineering using Erwin. Involving in Information administration including creating new users and groups, backing up the repository and domain as well as handling various upgrades. Used Informatica B2B data exchange to handle EDI (electronic data exchange) for handling the payments for the scheduled dates. Using major components like parsers, mappers and streamers in data transformation studio for conversion of XML files to other formats. Implementing various data modeling schemas such as star schema and snowflake schema. Using Informatica features to implement type II changes in slowly changing dimension tables. Involving in the development of Informatica mappings and also tuned session by increasing block size for better performance. Using different MDM concept for data transformation, normalization, error -detection and error-correction. Implementing various process of data cleanup and data validation using Informatica data quality.